Being fascinated by scents as a child and growing up with countless varied smells, Pheromones are important to Conor, “it brings back memories and instantly transports you to that place” says Mccreedy. He wanted to reproduce his experience with smells and take you on a nostalgic journey with the first candle in the world to smell like the colour blue. 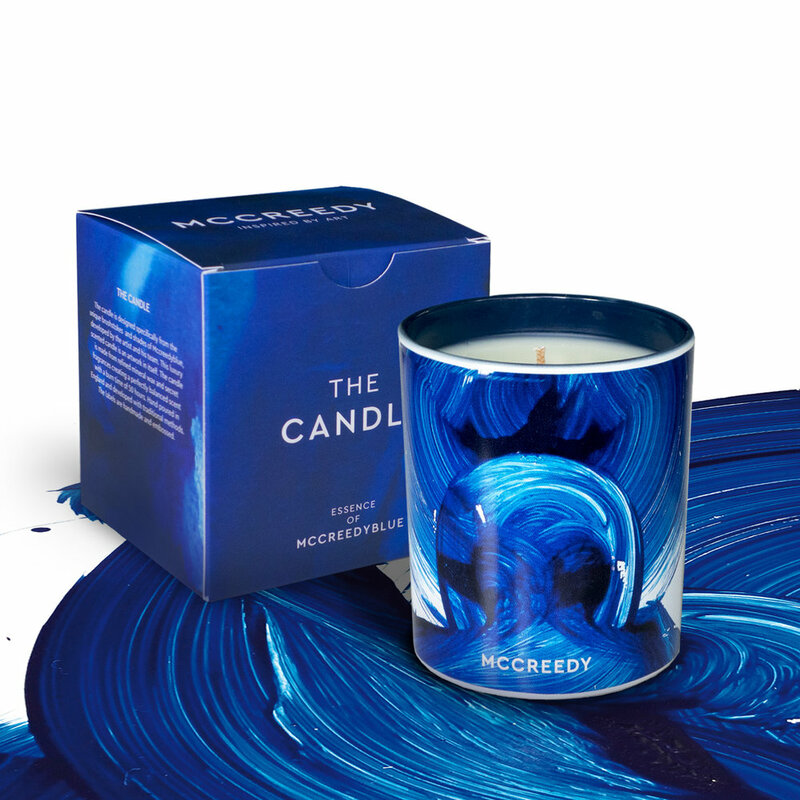 The candle is designed specifically from the unique brushstrokes and shades of Mccreedyblue, developed by the artist and his team. This luxury scented candle is an artwork in itself. The candle is made from refined mineral wax and secret fragrances creating a perfectly balanced scent with a burn time of 50 hours. Hand poured in England and developed with traditional methods. The labels are handmade and embossed. 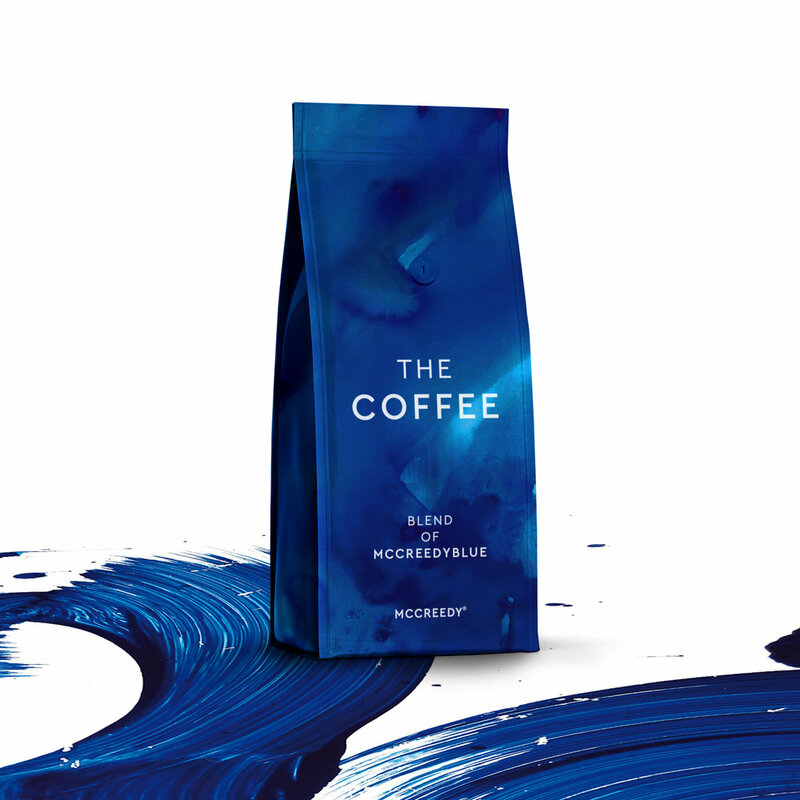 The secret ingredients are guarded from the public creating a very mysterious essence of Mccreedyblue. They are available online at mccreedyword and selected stores. Conor has always loved coffee so decided to make the best coffee and create an experience that he felt was not being offered to public. The craft of coffee making is like art. The coffee is sourced from the most supreme coffee farms in Africa, after all, coffee was discovered in Africa around the 11th century. Our unique beans are sourced from Tanzania’s ultimate coffee estates. It has a rich creamy texture which brings out the bold flavours. We do not roast this specialty too dark. Our pure arabica beans are all handpicked and are peaberrys, ‘the boss of all beans,’ which means in every coffee cherry there is only one bean, making it more exclusive, all handpicked. Suitable as an espresso drink but also as a "long" coffee, it is characterised by its round, full flavour with pleasant acidity. A touch of chocolate and a fine sweetness on the finish complete the whole. The plants are located on the luscious highlands of Northern Tanzania on the outer slopes of the Ngorongoro Crater. The location height is at 1700 meters above sea level, combined with the exceptionally fertile qualities of the volcanic soil common to the crater area, allows this coffee plant to flourish in their natural environment. The bags are available online at mccreedyworld and exclusively in our very own cafe. Collaboration: TIMO x MCCREEDY The Mccreedyblue trademark splash swim trunks and beach shorts combine luxurious art prints with modern tailoring. The trunks are made for the sun and more. From the very beginning, staying true to the TIMO brand philosophy was of parmount importance, which is to take fun seriously, hence the creation of these limited edition art trunks. They are contemporary whilst taking on a timeless design. Every pair of TIMO x MCCREEDY trunks come with hidden functional details. Pockets for key cards and a waterproof bag, to allow the wearer to have as much care free fun as possible on the beach, around the pool, styling in the city, on safari, looking hip in the gym and so comfortable you could wear them to bed. The pockets are deep, allowing space for cards or phones that don’t fall out. They are incredibly comfortable with a flawless artistic design making this product a true work of art. The shorts blend into the ocean waves and become one with the endless shades of blue, these are the one and only art trunks. They are available on both Timo trunks website and mccreedyworld as well as selected stores. Collaboration: GLATZ x MCCREEDY Artist Conor Mccreedy’s splash painted umbrellas for Glatz are a stroke of genius. The world's most exclusive umbrella maker Glatz collaborates with world renowned artist in his signature trademark colour known as Mccreedyblue. The collaboration showcases passionate explosions on state of the art materials which only dreams are made of, Glatz uses the finest Swiss quality and UV protected fabrics to create some of the most magnificent umbrella shades in the world. The company’s latest collaboration, with art-world star Conor Mccreedy, is not to be missed. Opening this umbrella with its big splashes in Mccreedyblue symbolizes a magnificent yacht sailing through the seven seas, which have an uncanny resemblance to the iconic splashes made by the artist. Mccreedy creates his celebrated brushstroke splash paintings by applying large vivid strokes to the canvas with one of his homemade brushes. The result is a line of limited edition teak wood umbrellas that feature the artist’s signature brushstrokes. This is the Rolls Royce of classic sunshades. It enchants many people with its nostalgic charm. Characteristic features of the umbrellas are fine materials such as natural teak wood, rustproof metal fittings and corner mounts reinforced with leather as well a double pulley system. Glatz has long been admired for its storied tradition of excellent craftsmanship, elegant designs and Swiss quality. “Qualities that are also important to me as an artist” says Mccreedy. Buyers are able to select the iconic splash design on any style of umbrella they wish and can be made exclusively to order. They will be available, starting September 1, at select Glatz locations and retailers, online at Glatz and mccreedyworld. Starting prices 2,900 USD a piece.